Isao Tomita, the Japanese composer and producer whose eerie and spacey arrangements of classical music explored the possibilities of synthesized sound and influenced generations of electronic musicians, died last week in Tokyo. His death was announced by The Japan Times on Sunday, following a private funeral. He was 84. The son of a doctor who worked for the Japanese conglomerate Kanebo, Ltd., Tomita spent part of his childhood in Japanese-occupied China, where a family visit to the circular Echo Wall at the Temple Of Heaven in Beijing sparked a lifelong interest in acoustics. After completing an art history degree at Keio Univeristy, Tomita pursued a career in music, initially composing radio jingles and TV themes. In the 1960s, he joined Mushi Production, the animation studio founded by manga legend Osamu Tezuka. His big break came from scoring the popular TV series adaptation of Tezuka’s Kimba The White Lion (also known as Jungle Emperor), directed by Eiichi Yamamoto (who also directed the recently re-released Belladonna Of Sadness). 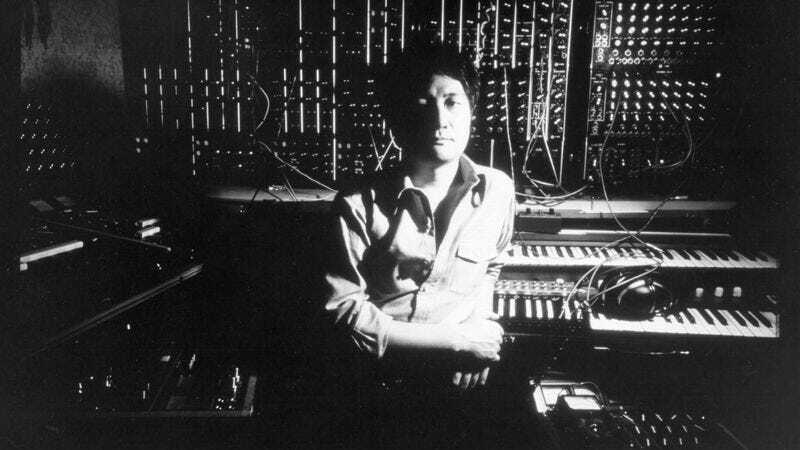 Inspired by Wendy Carlos’ 1968 hit album Switched-On Bach, Tomita travelled to the United States to acquire a custom-built Moog synthesizer. Over the next few years, he built a private recording studio dedicated to electronic music. His first album of electronic music—Switched-On Rock, recorded under the name Electronic Samurai—came out in 1972. Though openly derivative of Carlos’ style, this kitschy collection of Beatles and Simon & Garfunkel covers showcased Tomita’s mastery of analog electronic instruments, mixing watery “wah”s with synthesized whistles. Success came with 1974’s Snowflakes Are Dancing, which imaginatively translated the music of Claude Debussy into a futuristic soundscape of ice tones and phased shimmers. An international hit, Snowflakes Are Dancing was nominated for four Grammys and made Tomita an easy-listening favorite. But though it had plenty of mainstream appeal, its ambiance and sonic color also represented an important innovation in electronic music. Tomita would continue recording in a similar vein, mixing his love of Romantic-era composers and music technology for playful album-length treatments of Modest Mussorgsky (Pictures At An Exhibition) and Gustav Holst (Tomita Planets), while also trying his hand at everyone from Charles Ives to John Williams. Switching from analog programing to MIDI in the early 1980s, Tomita became less prolific. He continued composing for film; his most celebrated later works are his evocative scores for director Yôji Yamada, most notably for Twilight Samurai. At the time of his death, Tomita was working on Dr. Coppelius, an adaptation of Léo Delibes’ ballet Coppélia that makes use of voice synthesizers and holograms.